Ever wonder if you are eating too much protein? Sick and tired of hearing about protein powders? 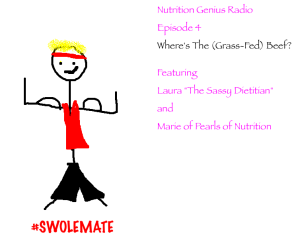 Want to know how to be a #swolemate? Tune in this week to hear about all the above AND what all of Marie’s ex-meathead-boyfriends are asking about protein! If you like what you hear let us know in the comments and SHARE on social media with all of your friends, family and strangers. Previous Previous post: #3: All the Carbs! ?